There are many depictions on painted vases and murals of the ancient Maya playing musical instruments. We also have been lucky enough to find remains of these instruments too. Instruments could be made out of clay, wood, bone, shell and even reeds such as trumpets, drums, flutes, whistles and rattles. Music was played on many occasions, from ballgame events and warfare to festivities at court. The image below depicts a conch shell that was used as a trumpet. 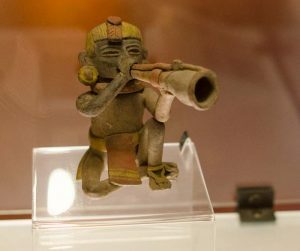 Music from the Land of the Jaguar: The Princeton University Art Museum. 4 Responses to "Maya Music"
After I initially commented I clicked the -Notify me when new comments are added- checkbox and now every time a comment is added I get 4 emails with the same comment. Is there any approach you may remove me from that service? Thanks! Hi Zula, No problem. I will ask the site manager to do this, but in the meantime I suggest you just mark the email sender as junk or block sender so that you won’t get these comments anymore. Hello Diane. Where is the figurine kneeling and playing the trumpet from? Where is it currently located/exhibited? Thanks! Hello there. 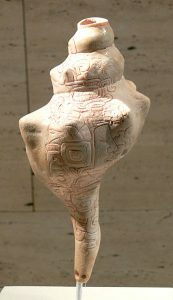 It is exhibited in the archaeological museum at Casa Santo Domingo in Antigua, Guatemala.